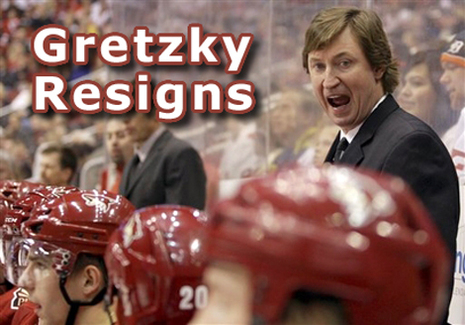 On 5 May 2009, the Coyotes' holding company, Dewey Ranch Hockey LLC, filed for Chapter 11 bankruptcy, Moyes agreeing in principle to sell to Research in Motion's Jim Balsillie for $212.5 million. Balsillie then announced his intent to move the team to Hamilton, Ontario. The NHL responded by stripping Moyes of his ownership, and going to court to block the sale. Gary Bettman announced the formation of four ownership groups, one headed by Chicago Bulls and Chicago White Sox owner Jerry Reinsdorf, in order to keep the team in Arizona. An auction for the Coyotes is scheduled for 5 August. While Gretzky has kept a low profile, his recent comments seem to support the sale of the team to Reinsdorf. GLENDALE, Ariz. -- Wayne Gretzky's tenure as coach of the Phoenix Coyotes, a period marked largely by on-ice futility, ended abruptly Thursday when the "Great One" announced he would be stepping down amid the financial turmoil surrounding the team. The Coyotes hired former Dallas Stars coach Dave Tippett hours after Gretzky announced his departure, which had been rumored as the bankruptcy court battle between Canadian billionaire Jim Balsillie and the NHL over the sale of the team dragged on. 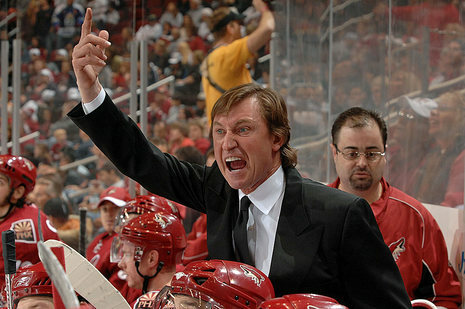 Gretzky, who was due to make $8.5 million this season, coached the Coyotes from 2005-2009, finishing with a 143-161-24 record, and the team missed the playoffs in all four seasons. Gretzky, 48, also owns a small piece of the franchise. Gretzky steadfastly maintained that hockey could thrive in Phoenix, a place where ice is more common in margaritas than skating rinks. But the empty seats in Jobing.com Arena and minuscule television ratings have told a different story -- as did the absence of a local bidder in the auction for the team. The Coyotes may have seen Gretzky as an icon who would promote hockey in the desert. But Gretzky was never much of a presence in the Phoenix sports scene, and he virtually disappeared after owner Jerry Moyes filed for Chapter 11 bankruptcy in May. Gretzky's father, Walter, said he spoke to his son Thursday and said he felt sorry for Wayne because he's caught in the middle. "No matter what happens, they'll say it was all because of Wayne," Walter Gretzky told Hamilton's CHCH News. "Everybody has to find a fall guy and they'll point their finger at Wayne even though he had nothing to do with this." Walter Gretzky said his son plans to spend time with his family and take a break from hockey for now. Captain Shane Doan said news of Gretzky's resignation "was definitely a surprise." "I'm not angry," Doan said. "We're moving on. Everyone realizes that this situation's unique. People are saying, 'Well, this should have been done, that should have been done.' It's such a unique situation where he's part of management, he's part of an ownership group, it's in bankruptcy court. I mean, everything is so convoluted that nobody really knows what's going on." Gretzky is the leading scorer in NHL history, and every Coyote was familiar with his legacy. "Any time you have any opportunity to be associated with Wayne Gretzky in any form, it's such a unique and rare opportunity," Doan said. "As a coach, every year he got better and better." But Gretzky brought little of his magical on-ice form when he moved behind the bench. Gretzky joined the franchise on Feb. 15, 2001, when Moyes' ownership group completed its purchase of the club. Moyes last May took the team into Chapter 11 bankruptcy, igniting a lengthy and complicated court fight over the team's future. The promise of Gretzky's first season never materialized. The Coyotes slipped to 15th in the Western Conference in 2006-07 and didn't finished higher than 12th during his tenure. With their future owner undetermined, the Coyotes have struggled mightily to sell tickets for the coming season, which begins next week. Balsillie on Wednesday made the pledge to keep the team in Glendale, Ariz., this season if he wins an auction for the franchise. He does, however, plan to move the team to Hamilton, Ontario, as part of his $242.5 million bid. "It's been impossible to sell tickets because nobody knows if it's going to be here," Moyes said earlier this week after yet another hearing in bankruptcy court. "So I think this will be the opening of the floodgates, and if the fans are convinced that the team needs to be here, and sponsors, this will be an opportunity for them to prove that the team should be here. "That's what I've said all along -- my first choice has always been to leave the team here and find support to leave it here." The Coyotes have lost more than $300 million since the team moved from Winnipeg, Manitoba, in 1996. The franchise has lost at least $34 million in each of the past three years and was given financial assistance by the NHL last season. PHOENIX -- Wayne Gretzky's tenure as coach of the Phoenix Coyotes, a period marked largely by on-ice futility, ended abruptly Thursday when he announced he would be stepping down amid the financial turmoil surrounding the team. The Coyotes had no word on a replacement. Associate coach Ulf Samuelsson had been serving as interim head coach during the preseason, and the team this week hired former NHL head coach Dave King as an assistant. The Coyotes said the team's Thursday practice at Jobing.com Arena would be closed to media members and fans. Gretzky joined the franchise on Feb. 15, 2001, when Jerry Moyes' ownership group completed its purchase of the club. Moyes in May took the team into Chapter 11 bankruptcy, igniting a lengthy and complicated court fight over the team's future. Gretzky surrounded himself with friends, including his former player agent, Michael Barnett, who was fired as general manager after the 2006-07 season.